Juicy, Juicy :-) - Time for a nice cup of tea? In two weeks I have drunk many juices, nibbled on nuts and bananas, felt pretty good and lost 4.3 kg :-) Haven't been too hungry, the juices are so concentrated and full of goodness, feel very full. My suprise discovery has been sweet potato juiced - when added with blueberries and pears - makes a lovely dessert drink. Beetroots produce a lot of juice, have a lovely colour, but are an acquired, earth taste. This morning's favourite was orange, carrot and red pepper. Tangy and sweet. 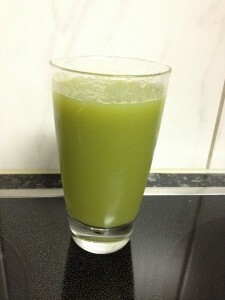 Am now drinking courgette, celery, cucumber & apple. it's me, the antiquated vicar. V. well done on the juicing. I plan to do 15 days starting Boxing Day.